(Note: I copied the entire line as shown, and pasted it into the terminal window and hit the return key). Everything appeared to install correctly, but I noticed that after the install was complete, there was a line displayed that said, the current version was up to date. After starting CQRLOG, I noticed that I'm still on version 2.0.5. Even a computer reboot didn't do anything. Any thoughts as to what may be going wrong? Could it be that you have cqrlog exec now in 2 different locations? Do they all start same version? If not update your icons to point to right one. Take copy of your ~/config/cqrlog directory (with all subfolders and files) as backup. Then remove install. I think in debian based systems it is "apt-get remove cqrlog". When successfully ended give again "whereis cqrlog". If there still is "cqrlog" somewhere you have to manually remove that file. Then try again to install (repository and program) using line copied from download page. If you still get old version remove it again and try to install binaries "cqrlog_2.1.0_i386.tar.gz" or "cqrlog_2.1.0_amd64.tar.gz" depending your hardware. Apt stores it's lists of repositories under /etc/apt from there you should chek that you really have Petr's repository installed ok.
Repository and it's contents should be ok as there are many users that have succeeded to install 2.1.0. Being an Fedora user myself I can not give any better detailed informations. Systems are bit different. How should I upgrade? Do I remove all of the files listed above as in your directions above? Do I install over 2.05? After that everyting can be tested without loosing logs. As mentioned here before I would try uninstal and after that check that all exisiting binaries have really disappeared. Then if ppa-install does not work use binaries (.tgz) from download page and extract them to system. It would be nice to have a step by step description of the installation. You ask step by step description of the installation. First backup your ~/.config/cqrlog folder with all files and subfolders to safe place (usb stick, perhaps) to save your logs. Then download cqrlog_2.1.0_amd64.tar.gz (or the i386 version if you have 32bit OS). You can use browser on wget (console) for download. tar vzxf cqrlog_2.1.0_amd64.tar.gz (change filename if 32bit version). Now there is folder "usr". It is same structure than you have from system root "/"
under "usr" you have "bin" and under that you have binary "cqrlog". I can not confirm this binary works over 2.0.5 install (I do not have 2.0.5 any more) but it is worh of trying. Now it goes right away to right folders. After that you might have to create icon for starting it as this kind of installation does not make icons. Consult you desktop help for making start icons. "You can use browser on wget (console) for download." Should be "You can use browser OR wget (console) for download." Thank you Saku, I will try during the week end. Thank you for this post. I'm running LMDE2, which is still running Debian old-stable( ! ) and it was impossible to update from 2.0.4 to 2.1.0 by the .deb archive as I've always done in the past, because of dependencies (libssl-dev & libmaria..dev). I uninstalled my previous install, and dload/install from the tar.gz and now it works! It might be true if repository was on same hardware as hamqth.com that chrashed (hd raid falilure) just a little time ago. We need someone using ppa, or Petr himself, to confirm that. As I have stated before I have the same problem. All past updates have been installed from the repository by Mint upgrade manager. The latest was not. The fact that it may be missing from the repository is possible. This is the first time in years I'm having trouble updating CQLog from the update manager, I suggest we ask Petr to check the contents of the ppa to be sure v 2.1 is included. Look forward to hearing from Petr. You have not answered the basic question. Does the current version of CQRLog exist in Petr's repository? What happened to the automatic updates through Synaptic? I am a user of the ppa and have been for years . The upgrade should have happened automaticly as it has with past updates. I have not had any problems until now. Your instructions are appreciated but they relate only to the zipped package. Please address the issue with the ppa. Can we not check with Petr to see if the update is in the ppa? As stated before I can not comment ppa issues as I am a Fedora user, that is not Debian based linux and it uses "dnf" for package install. So I can not test Synaptic or any other method here wiithout first installing Debian/Mint/Ubuntu OS. I do not have either a "secret hotline" to Petr, so I'm as lost about ppa as others. that he now need to focus more to other things like family and work. I just try to give as much help as I can on those things what I can because I feel stupid if I see someone asking help without getting any answers here. I'm sure .tgz installation method works also for Debian based systems, but it is little more complicated as Synaptic or some other GUI based things. And if it works, just copy the only one binary file to /usr/bin solves upgrading. And it does not spoil anything as system still thinks 2.0.5 is installed although binary would be 2.1.0 and next ppa upgrade should work in usual way. That's all I can give for now! Thank you for your comment. I'll install from the archive as you instructed after backing up cqrlog. You are right to try to be of help. You should not feel stupid if you do not know all the answers. Hopefully when things are better for Petr the ppa will be working again. I'll let you know how it worked out. I have followed your instructions and now have CQRLog 2.1.0 running from ~/Desktop/tmp/cqrlog-2.1.0/usr/bin. Seems to load OK and run. I have not fully tested it yet but, it will probably work. Next Should I copy only cqrlog file to /usr/bin overwriting the cqrlog file there. Is that correct? then copy over the .config/cqrlog directory if needed. If it runs ok from tmp folder and you see all your previous qsos ok then you can copy the binary "cqrlog" to /usr/bin (you must use sudo (be root) to have write permissions there). There is no need to copy over .config/cqrlog/ anything if old qsos show up ok and you can add new ones. Just keep the copy of .config/cqrlog/ as backup. In case you notice later that something is wrong: reinstall 2.0.5 from ppa and after that copy backuped files over the .config/cqrlog and you are back at the point you did start start. /usr/bin/cqrlog is then the only file you have to copy for upgrading now. Worked with CQRLog V 2.1 this weekend. Tried all the functions I normally use and all worked as expected. I did have one problem however. When I start CQRLog I have it set to control the radio. No problem there. If I start WSJT-X in the remote mode from CQRLog WSJT-X tries to to control the radio and an error results. To work with WSJT-X remote I must start CQRLog without controling the radio. The WSJT-X is a major feature. I use it when I'm using FT8. I like to operate voice then switch to digital. Is there a simple way I can do this without changing my preferences and restarting CQRLog? Perhaps a menu choice to start and stop rigctrl. Thanks for all your help and patience. I still think that CQRLog is one of the best logging programs out there. Nice to see that you have succeeded to upgrade with manual process. You should start cqrlog first and let it start rigctld. Then you may start wsjt-x manually. Do not set cqlrog preferences to start it. Not recommended as if cqrlog dies it will pull down also wsjt-x. After that choose "Remote mode for wsjtx". Work qsos. Unselect "Remote mode for wsjtx" and continue with CW , RTTY or Fone qsos. You have to start rigctld only once ! Easiest way is to start it via cqrlog. You can also start it at linux start using command line at file /etc/rc.local (i this it is the place of your linux version). You can get line format for /etc/rc.local by giving console command: ps ax | grep rig while cqrlog is running. By copying all from "/usr/bin.....until end of line" you get working command to start rigctld from console, or rc.local file. But as said: Easiest way is to start rigctld from inside of cqrlog. And start always cqrlog as first program. You have to set wsjt-x settings again. I think you use your rig name there. Instead use "Hamlib NET rigctl"
By that setting no new instance of rigctld is started and you can switch between programs. (even more than just cqlrog and wsjtx if all are using same rigctld). See the pictures of my setup. Now that you can update manually and you are active wsjt-x user you could try also latest test binaries (for x86_64 kernels). Followed your suggestions. That cured the rigctl problem. No I have problems with Hamlib errors. "hamlib protocol error while getting VFO status" and "hamlib protocol error getting ptt status" Both occur frequently. If I'm trying to make a qso WSJ-X shuts down the automatic xmit/rcv sequence. These errors occur at random times and do not seem to be related to any event. WSJT-X will run for awhlle then error out. I do not have any problem when WSJT-X is running alone. I think both programs may be polling the radio at the same time and a conflict occurs. I am using a USB serial adapter cable which has per form well in the past. Can we modify the sampling rate to give priority to WSJT-X and less to CQRLog? What do you suggest? As these errors interupt WSJT-X qso's; I'd like to get this issue fixed. Do yo have polling from programs about same level as in my picture? (more than few seconds for both). As you are now using same rigctld for both programs the rigcld will handle rig polling and you get actual information to your programs from rigctld, not directly from rig. Rigctld itself has many parameters that can be changed. There are delays and repeats and all kind of settings. You just have to do a bit Googling to find description for them all. Perhaps first starting with console using command "man rigctld". Use "rigctl -L" at console for option list. Check them. If you get different version numbers use the higher. I think it is "rigctld-wsjtx"
Put rigctld-wsjtx path to cqrlog/preferences/trx control to get newer version running. Does it work any better? If not, then it is time to play with "--set=" parameters for rigctld. Let's try these for next. After that you can go deeper search by taking start of rigctld away from cqrlog. Start rigctld first from console (see how to get the command line with parameters from previous messages) adding an extra parameter "-vvvvv" to the parameter list. Then start cqrlog and finally wsjt-x. When programs run you can see debug information from rigctld console and see what goes wrong when errors happen with wsjtx. Since I reworked the configurations it looks like the hamlib protocol errors are gone. I'll watch this over the weekend to confirm. Now have a new problem. QSO data does not transfer from WSJT-X to CQRLog and the "wsjt-x monitor" window is not populated.The WSJT-X log function works correctly. Could this be caused by the high (2000) poll rate in CQRLog? Tried the option in CQRLog menu to connect to WSJT-X remote but does not correct the problem. "The WSJT-X log function works correctly. " Means this that wsjt-x logs ok it's own log, or logs ok to cqrlog's log ? If logging is transferred to cqrlog ok when pressing OK-button at wsjtx's logging window UDP transfer must work. If not check cqrlog/preferences/fldigi/wsjtx interface and wsjtx/settings/Reporting to have same values. It is better to use "127.0.0.1" in some cases than word "localhost" even it should mean same in address. You should always set "cqrlog/NewQso/File/remote mode for wsjt" to get cqrlog read information from wsjt-x program. 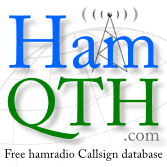 appearing to NewQSO/callsign and possibly additional information from qrz/hamqth if configured. cqrlog. If CQmonitor does not open when "cqrlog/NewQso/File/remote mode for wsjt" is set you can open it from "cqrlog/NewQso/Window/Wsjtx monitor" (this varies between official and beta binaries). IF you double click any line on CQ-monitor it should initiate qso with that station activating wsjt-x TX(+ set frequency). WHEN you finish qso press "log qso" at wsjt-x main screen to get wsjtx logging window open, or modify setup so that wsjtx will pop up logging window when 73 is sent. Add possible power and remarks information and press OK. That will close wsjt-x logging window and move data to cqrlog's log. Poll rate of 2000 (2sec) is not high for modern PC and should not make problems. 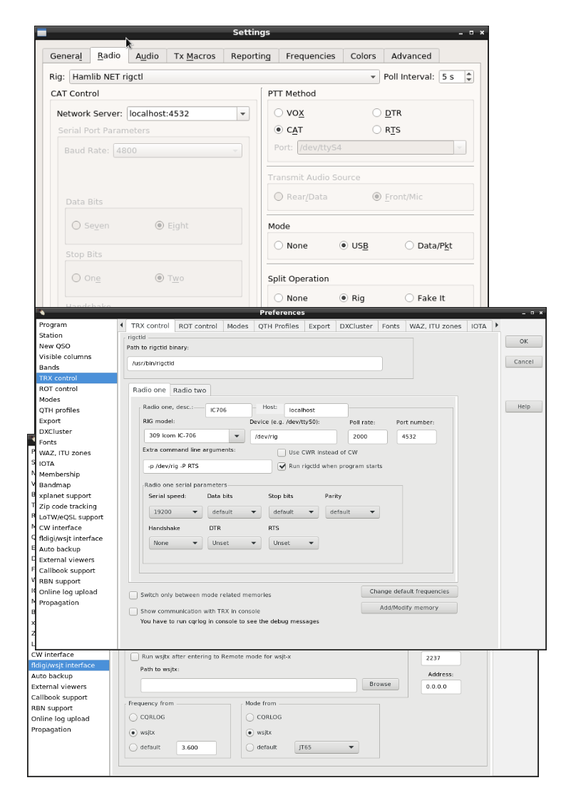 It is for beta binary, but most of text is valid also for 2.1.0(001) release. I got it working now. The problem was that I had not configured PSK Reporter properly. Your pdf on the additions to CQRLog was most helpful. Hopefully it could be added to the CQRLog documentation. Now that I have configured PSK Reporter I assume my QSO data will be added to PSK Reporter. You set split operation in the radio section of WSJT-X to rig. I'm not sure why you set it that way. Would you please tell me why this is of benefit. Fine that you have your settings now in order. For split operation: Always use it if your rig supports it. You will notice support by selecting it and testing. Explanation can be found when wsjt-x is running selecting "help" from top menu of main screen and from there select "Local user guide". Opens to your web browser. See section 4.2 Radio / sub section "Split operation"
All is working now. No problems. Thank you for all your help. We can close this thread now. I recently did a fresh install of Ubuntu 17.10 and can report that Petr's repository is still providing only version 2.0.5 of CQRLog (as of October 30, 2107). Previously I was working with Ubuntu 17.04 (upgraded from 16.04) but was able to get CQRLog 2.1 from the repository. It eventually ran fine, after I figured out the OTHER dependencies that Synaptic apparently didn't know about. That was very frustrating. I'm brand new to Linux and this almost caused me to give up the whole thought of using Linux for my ham activities. I haven't had any luck getting CQRLOg 2.0.5 to run, though, in Ubuntu 17.10. So far it's having trouble connecting to the sql database. Here we go again........I'll post THOSE questions in a separate post. I haven't tried a manual installation of CQRLog 2.1-- I wonder if it would have better luck with the sql connection......? I hadn't seen that yet, Saku. I'm not sure I understand exactly what Petr was trying to say there other than NO mariadb stuff is needed. I'll have to go check, but I don't think libmysqlclient18 is even in the repository any more. I remember installing libmysqlclient.20, but it wasn't included in the install that Synaptic did for me. I was just poking around trying to find something that CQRLog might like......but it wasn't enough to provide a connection to the sql database. I'll try to remove anything related to mariadb and see where that gets me. I have installed the latest version of linux mint (18.2 ) and all is working fine. Latest release of cqrlog is on the repository.